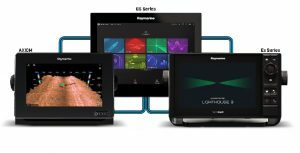 Raymarine’s new LightHouse 3.3 update enables Raymarine eS-Series and gS-Series owners to quickly and easily upgrade their MFDs (multifunction displays) at no charge. The new 3.3 upgrade is the first version of LightHouse 3 to support Raymarine’s gS and eS Series MFDs. It will allow gS and eS Series owners to enjoy all the benefits of the Raymarine’s very latest operating system and enable them to network with Axiom or Axiom Pro displays. This means they can experience Axiom’s award winning gyro-stabilised, lifelike 3D sonar, on their existing MFDs, simply by adding an entry level Axiom 7 RV, from as little as $2499. Other LightHouse 3.3 benefits include enhanced AIS target overlay in radar mode, Navionics Plotter Sync support and some rather special sonar enhancements. These include: RealVision 3D historical sensitivity and new RealVision 3D depth and intensity scales; smoother and more visually appealing sonar range transitions; a new Disable All Sonar option from the shortcut menu. The free new LightHouse 3.3 upgrade also includes a new battery voltage display option, enabling users to view voltage as a Data Overlay or a Side Bar Data item; remote software upgrade support for Quantum radars and enhanced diagnostics support. Mark Milburn, CEO of New Zealand Raymarine distributor Lusty and Blundell Ltd, says the new upgrade is available now, is easy to download and install and is completely free. “Raymarine gS and eS owners simply need to visit www.raymarine.com/multifunction-displays/lighthouse3 to download the new upgrade and then use a microSD card to install it. Raymarine’s Axiom and Axiom Pro users can also upgrade their software via the download and microSD card or simply upgrade using their Wi-Fi connected MFD,” he says.